All New! Perfect Location! Next to the Convention Center! Walk to Disneyland! All New Furniture! 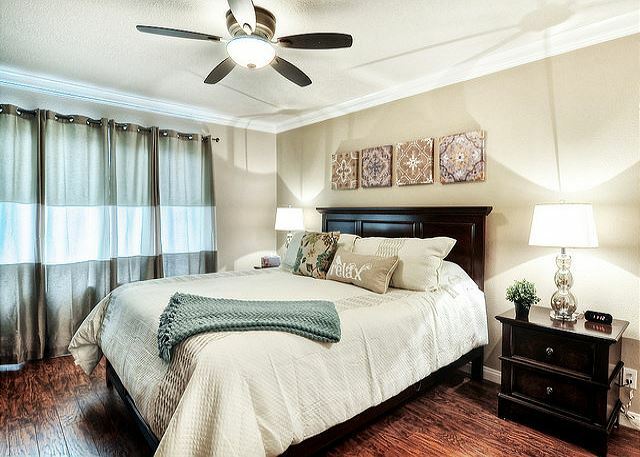 Ideal Location, Designed to Be Comfortable & Enjoyable! Decorated and UPGRADED! Wish Upon A Star for an Exceptional Home and Your Search is Over! You've Discovered the Most Beautiful Of Them All! Experience for Our Guests. 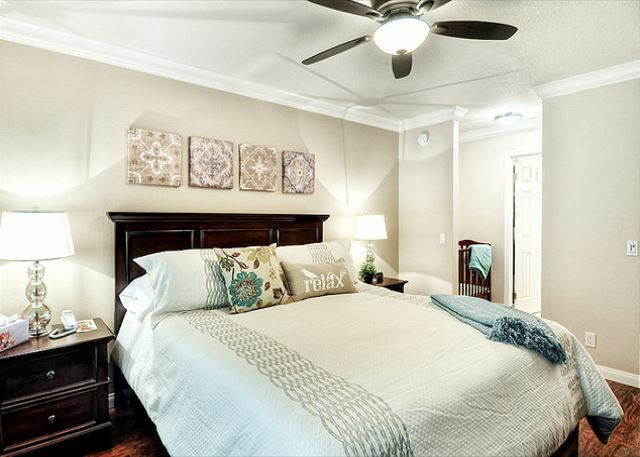 3 Bedrooms, 2 Baths all in a Spacious, Bright and Open 2-Story Townhome with 2-car Attached Garage. 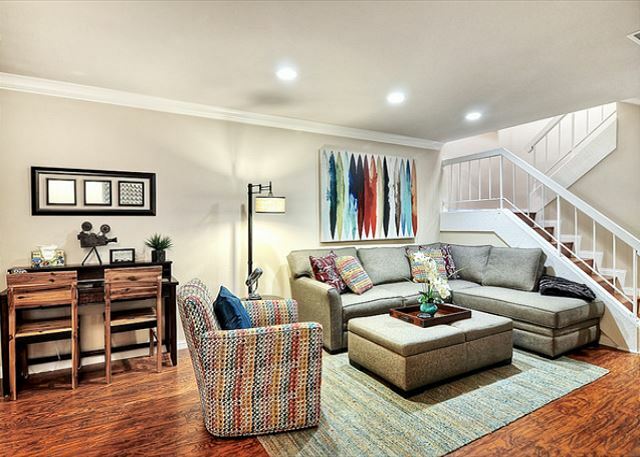 Stunning California Decor includes Neutral Colors, Wood Floors, Accents, All New Furniture and More! Step inside and let your vacation begin! 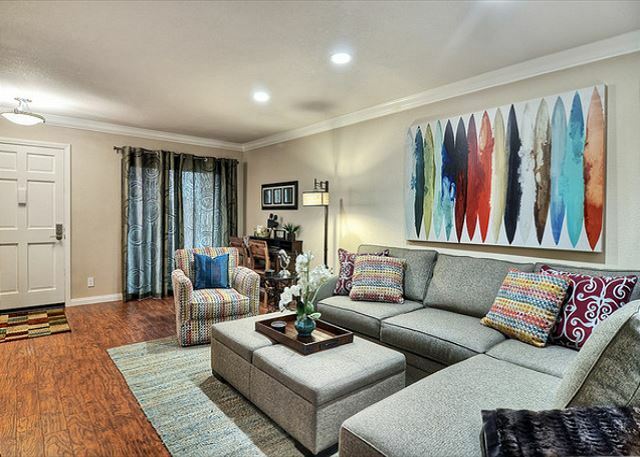 Relax in a Living Room complete with Cozy Sofas, Flat Screen TV with expanded cable and DVD. 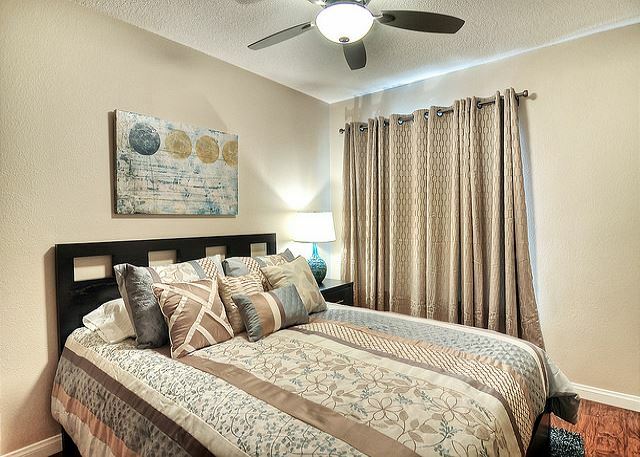 Dream your nights away in the Master Bedroom on comfy new mattresses. Highlighting the Second Bedroom is a Queen Size Bed, Desk and TV. Luxury Linens and fluffy pillows! 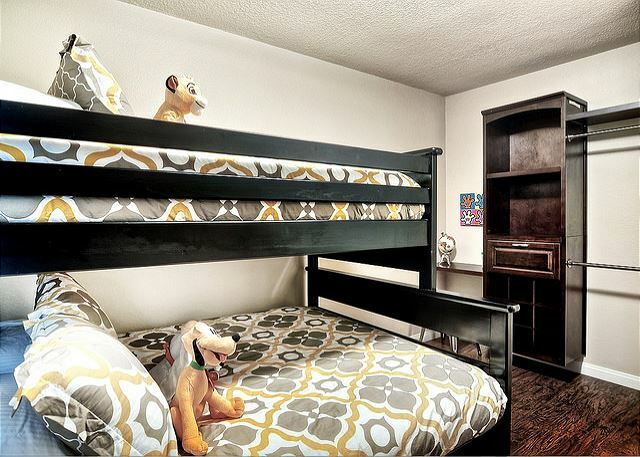 Your Kids will love their Special Room! 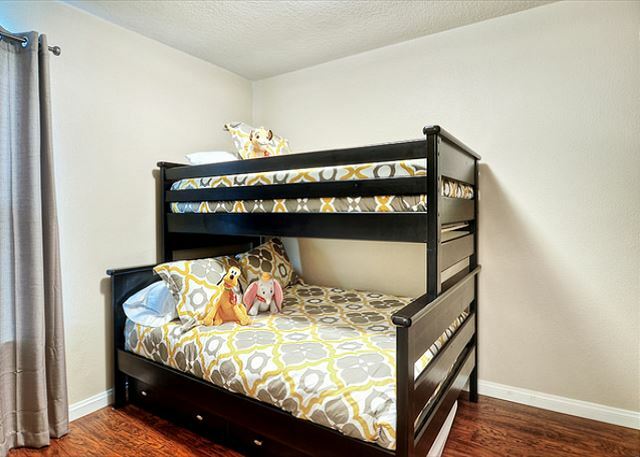 Bunk Beds with a Full on the Bottom, Twin on Top and a separate Twin bed, too. Need additional bed for your little one? Pack and play is also included. There's also a hide-a-bed in the Living Room Sofa. Two Full baths with tub and shower combination. Pamper yourself with personal amenities including shampoo, body wash, conditioner and soaps. Fluffy towels make you fee like you're in a spa! 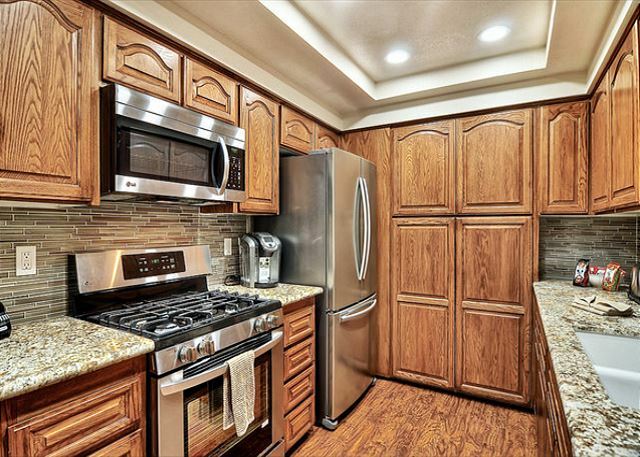 A Chef's Delight, the State-of-the-Art Kitchen features Stainless Steel Appliances, Sparkling Clean appliances. 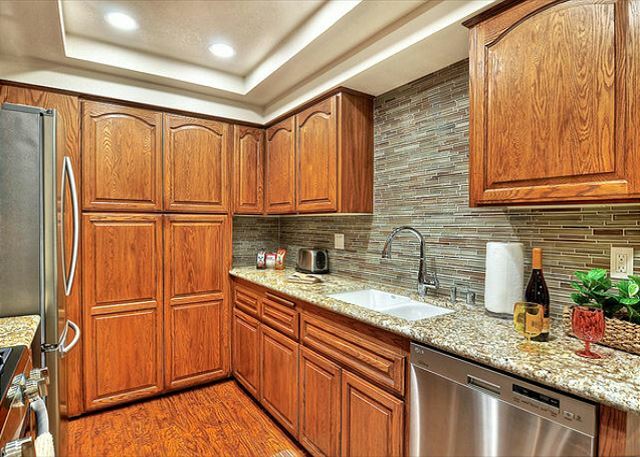 Fully Equipped and Stocked, you'll find everything you need to prepare a yummy meal before a night on the town, or a simple snack before heading out for a day of fun at Disneyland or sightseeing. Grab a cup of coffee or a casual meal. 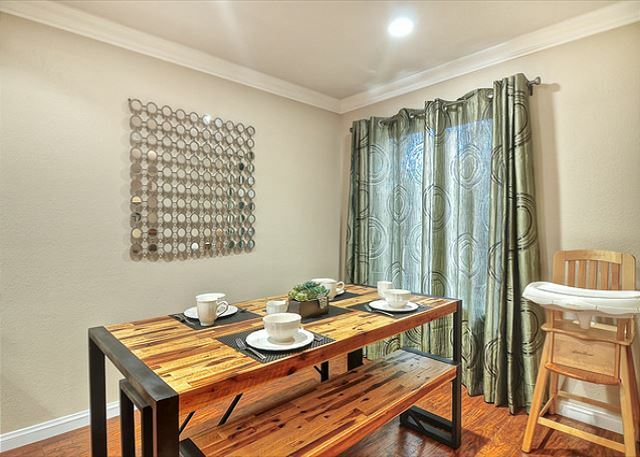 Share and Create Memories after a busy day, you'll love gathering around the Dining Room. Seating for 6 (Plus high chair) offers a great place for everyone to share their stories of their adventures, and to enjoy get together with family and friends. Want to "eat out?" 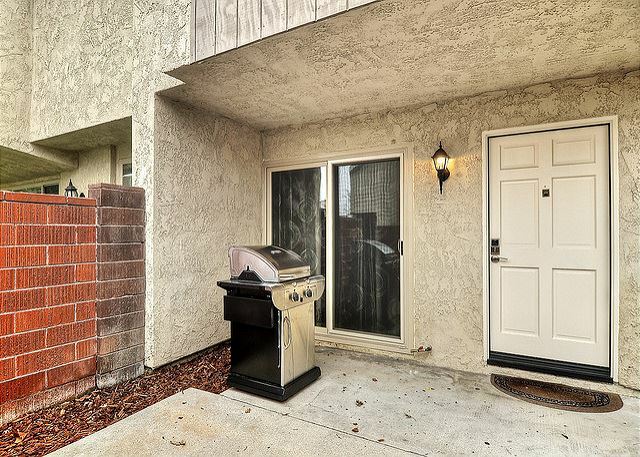 Grill steaks or burgers on the gas BBQ in your private front patio. Bask in the sun with a cup of coffee or glass of wine! If you need to work while away from home, you'll appreciate the Desk with Hi-Speed Wireless Wi-Fi access. Watch your favorite Movies, Sports or News on the Flat Screen TV. All the Comforts you desire, are Here! Furnished for your comfort and enjoyment, quality details have been added to ensure yours will be the best vacation experience! You'll be amazed at all the details and amenities provided just for You! Why stay in a small hotel room or apartment when you can spend your time in this stunning home at a fraction of the cost? A short distance to Disneyland, making it perfect for you to visit the Parks early and miss the crowds, head back home for a siesta, and then return to the Parks for an evening fireworks show! An Exceptional Home, Ideal Location, Designed for Your Never-To-Be-Forgotten Experience! Be Our Guests! Parking: 2 cars max.in 2-Car Attached Garage. No street parking, passenger vans, RVs or trailers. No additional guest parking. City Mandated “quiet time” from 10 pm to 9 am. Outdoor facilities including Private Patio, Greenbelts and Walking areas are off limits during these times. Guests agree to comply with the city and HOA requirements or they will be subject to fines, civil actions and or criminal prosecutions related to the violation. Check in 3 pm check out 10 am. AMAZING!! 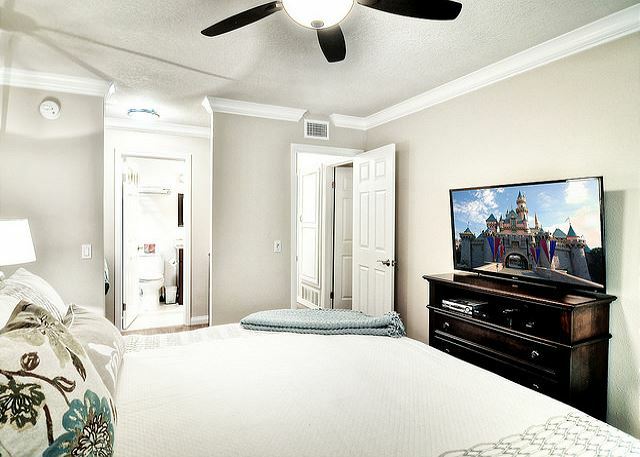 Valerie’s place is spotless, spacious, and conveniently located with a 5 minute walk to the convention center and about a 10 minute walk to downtown Disney! The beds were comfortable, the pool and hot tub was a nice extra, and the kitchen had everything we needed to make food for ourselves! We enjoyed our stay. There were a couple discrepancies and they were addressed in a timely manner. Our family trip was a success, which is all we hoped for. This was a great place to stay. Perfectly clean and very comfortable. What a perfect place for us. We had 4 adults and two kids stay at Valeries' place. It was clean. Comfortable beds. Kids loved the Disney stuffed animals in their room. Pool was nice and not crowded. It was an $8 Lyft from the front gate of the parks. Overall perfect for what we wanted. This accomodation was clean, tidy and perfectly located for our stay in L.A. for our time spent at Disneyland. It is a spacious accomodation, with a large kitchen, laundry and double bathrooms. It was meticulously clean and a quiet friendly and safe location in which to reside. It had fast internet, and tv in each room. 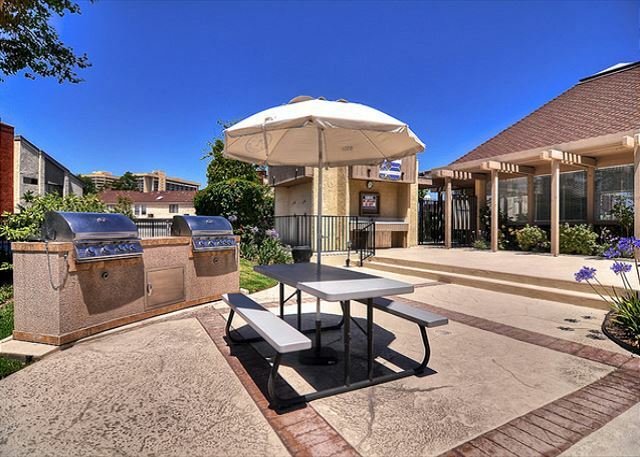 There is a BBQ outside for your convenience and the complex has a pool and spa. There is also a games room which we were unaware of however there was plenty to do to keep us occupied. Our host Valerie went over and above to make our stay easy and comfortable. 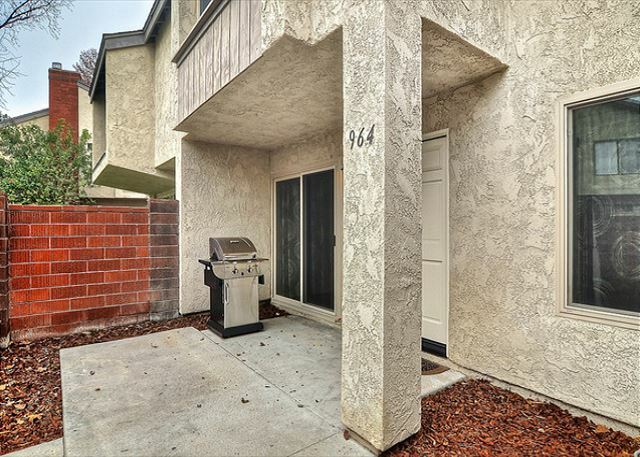 Great location, very nice townhouse, nice neighborhood, very close to Disney, comfortable furniture/beds, and nice patio with chairs and table. The only thing that could be improved was that the pool entry gate key ring didn't work. Once someone allowed us into the pool, it was very nice. Also, it was within walking distance to Disney for me and my family, but I would not have older family members walk that distance. Overall, a very good experience...I would rent this property again. The unit was nicely appointed, spacious. Didn't realize when booking that all 3 bedrooms share a bathroom upstairs - so there was no true master suite. We had to do a little condo shuffling as a result. Overall, very happy with the space, kitchen, outdoor space, proximity to Convention Center. My family and I rented this property for 8 days, as we were in Anaheim for my daughter's national dance competition. The location was fabulous - just steps away from the convention center, so we were easily able to walk back and forth during breaks, etc...the unit was also very close to the pool and hot tub, which was nice. The neighbours could be a bit friendlier and the master bedroom could use a full length mirror, but overall, the property was very clean, well appointed, and convenient. I would recommend both Valeries Vacation Rentals and this unit specifically to friends and associates. Everything you need for a home away experience. Great stay of a family of 6!!!! This was a wonderful vacation home getaway. I would highly recommend this property to family and friends. The home was just like the pictures showed. It was fully stocked and had all the comforts of home. We did find it wasn't really close enough to walk to Disneyland and had drive to the park instead. We traveled with seven adults and two children and there was plenty of room. 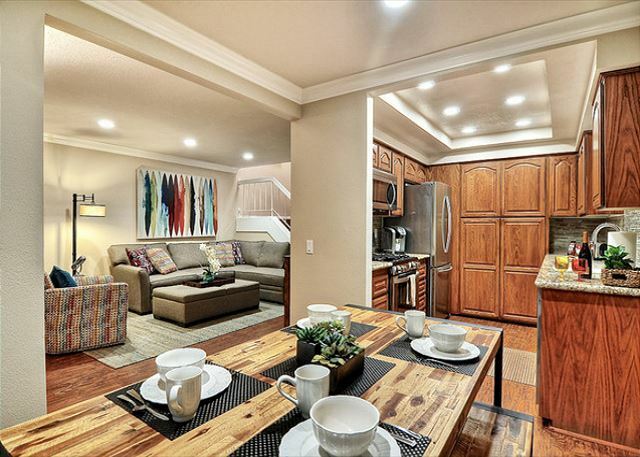 The kitchen was well-equipped, and the living area provided ample seating for all of us to hang out together. Each bedroom had it's own TV and super comfy beds, so we could also get away from each other. Great property--so close to the Disney parks that a few of us walked up there once; however after a whole day of chasing kids, I wouldn't have wanted to walk home. Well worth the money to park at Disney. This place was perfect for my family. It was a short walk to the convention center where the free tram took you right to entrance of Disneyland. If you wanted to walk to the park it was only 1/2 a mile. The house was really nice and met all of our needs. I would stay here again! Well maintained, felt home away home. 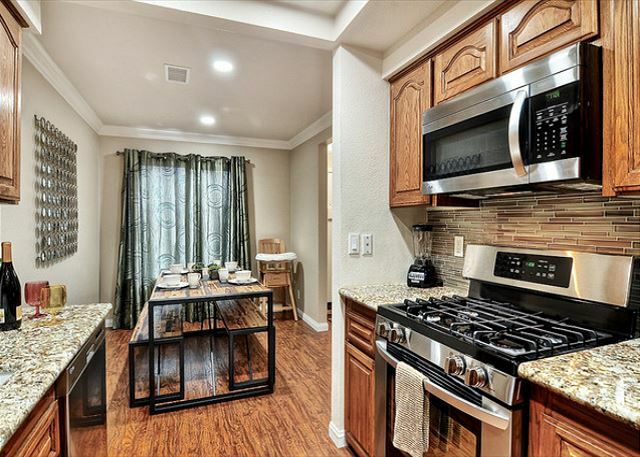 Great location - close to the convention center and Disney Land. Everything well prepared, we had a great stay and will come back for sure next year! The place was very clean and was exactly as advertised. The place is very close to Disneyland and its like 15-20 minutes walk to main disneyland downtown entrance. With just adults the theme park is walkable but with kids and strollers, its better to use uber (max charge is 5$ one way from this location). Regarding the place, it was very clean and fully furnished. Valerie was very professional and gave clear guidance in making sure our checking in was smooth. 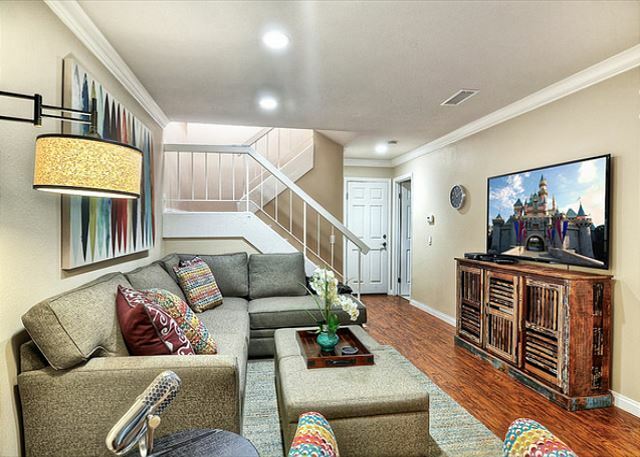 Overall I would definitely recommend this place for any family or friends who plans to visit Disneyland by staying in a home. Our Experience on this property was very satisfactory. The Advertisement on VRBO was exactly as it displayed. The only complaint that we could possibly have is the fact that the Thermostat on the a/c was programmed to only a certain degreees. The house got stuffy and No Ceiling fans n the dining or livingroom. Also, the fact that we had to keep quiet while in the home. Due to Home Owners that lived n the Complex and the fear of loosing Our Deposit if the Neighbors would call and complain. The places were clean, well maintained, and the staff very friendly and helpful.